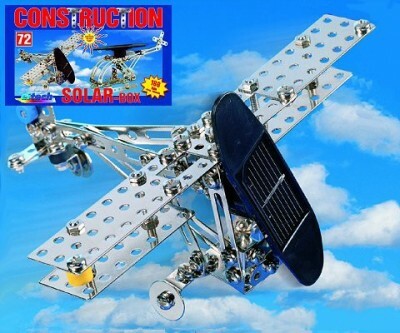 This Solar Aircraft Construction Kit allows you to build either a airplane or a helicopter from the parts included. The kit aims to help promote learning through play, by piecing the aircraft together and watching the blade turn in light the kit helps to show the abilities of solar power while being an engaging toy. The ﻿﻿Solar Aircraft Construction Kit contains all the parts required to construct either the helicopter or the airplane. The kit contains over 180 parts which has a ‘mechano’ feel to them, the metal pieces screwing together to form either model using the screwdriver which is included. The kit is supplied with full instructions which show you step by step how to construct either model. The propeller/rotor part contains the solar panel and the motor which spins it when it is in sunlight. The Solar Aircraft Construction Kit can be used as an educational aid to help teach children about the eco-friendly energy source of solar power. Because the models are supplied in kit form the child can get involved with them fully, enjoying creating either model before visually experiencing how effectively light energy is converted into electrical power which is used to turn the blades. As the solar panel works best in bright sunlight, this is recommended when teaching a child the abilities of solar energy although the blades will also turn when placed in bright artificial light. The Kit is suitable for ages 8+, though this is mainly down to the small parts in construction. A younger child can still enjoy watching the model and learning about solar power with an adult’s guidance. The construction kit is a great way to educate a child about solar power through play and creates a entertaining ornament for a bedroom that will never need batteries. The Solar Aircraft Construction Kit makes a perfect gift for child’s birthday or Christmas present. The aircraft kit is only £24.99.